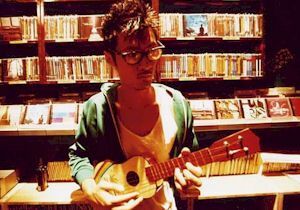 (left) Pu Pu and Daniel Wu, and (right) Shawn Yue and his little guitar. The Skinny: Creative and at times charming, Aubrey Lam's second feature is also overstuffed and egregiously obvious in its metaphorical implications. The film has some fine moments, but they're quirky to distraction. Ultimately, Hidden Track is better in parts than as a whole. Screen newcomer Pu Pu is Pu Pu, a young Chinese woman who's just been dumped by her boyfriend. Unfortunately for Pu Pu, she was totally enraptured with her fella, and as such encounters heartbreak with a decidedly sullen attitude. To ease her pain, she hightails to Hong Kong to visit her sister, who runs a fish store with her husband. While helping around the store, Pu Pu begins searching desperately for a certain song from Taiwanese singer Jay Chou. The song was the official anthem of Pu Pu and her ex, but finding the song is more difficult than she expects. She learns from Yu (Shawn Yue), a proprietor of a used CD store, that the song was a hidden track on the first 500 CDs of a particular Jay Chou album. Ergo, it's not that easy to come by. Luckily Yu owns a copy of the CD. Unluckily, he lent it out to new age guru (Eason Chan), who practices extreme yoga and hangs out in oxygen bars. Pu Pu attempts to get the CD from him, but he doesn't have it either. She continues to look for the CD, but each stop leads her to a new eccentric personality, including another used CD salesman (David Wu) who never uses the same name twice, a female taxi driver (Denise Ho), and a weirder-than-weird cop (Daniel Wu) who loves his mom a little too much. Each stop also allows for Pu Pu to find new facets and potential partners in love, the result of which could bring her closer to both the physical and metaphorical representation of the Jay Chou hidden track. Confused? Don't be. While the film's plot highlights Pu Pu's quest for the hidden Jay Chou track (the film's Chinese title is literally translated as Finding Jay Chou), she's really looking for something else: love. Even more, she's looking for that which love will bring in hopeful untold amounts: happiness. Yes, it's every lovelorn Gen-X girl's dream, the attainment of the idealized love, which is just as rare and hard to find as the hidden track on a limited edition pressing of a Jay Chou CD. The double meanings of the plot are both obvious and thoughtful. Someone went to great efforts to insure that Hidden Track was more than just a "girl loses boy and finds new one" tale. It's a film rife with quirky characters, situations, and even some badly-animated CGall of which is supposed to illuminate the existential quest for happiness and true love. At this point, the audience should be A) enchanted by the densely metaphorical narrative, or B) put off that the film seems more interested in its own cleverness than actually making much sense. Hidden Track comes from the pen and lens of Aubrey Lam. Long one of HK's more thoughtful screenwriters, Lam made her mark co-writing films from the United Filmmakers Organization (UFO, for the initiated) before directing her first feature, Twelve Nights, in 2000. A thorough examination of twelve nights in a soon-to-fail relationship, Twelve Nights possessed a fine eye for detail, but was also unengaging and even depressingly pessimistic. Hidden Track goes the opposite route, and is instead a breezy, quirky and enchantingly positive film on losing and finding love, and the strange connections we make in that search. Still, both Aubrey Lam's films do share one common connection: they're both distractingly self-conscious of their artistic aims. Hidden Track features all sorts of minor details and incidents which are meant to represent heartbreak and the search for love. Pu Pu's quest for the hidden track is one, but then there's the case of Yu. Besides running his own used CD shop, Yu is despondent over the loss of his dog, an affection he attempts to transfer to a turtle, plant andone would hopeanother person one day. Yu, like Pu Pu, can't be happy because he's not whole. He needs that other part of himself, which is obviously some other creature that he can love and care for. Pu Pu needs a true love to hold her and console her. And Jay Chou, in a ballyhooed and somewhat bizarre cameo, needs something to make his taste buds enjoy sweet foods once more. Hidden Track could have gone directly to its subject matter, but it chooses to take a circuitous route that attempts meaning through metaphor, a narrative tactic which is both obvious and a little off-putting.